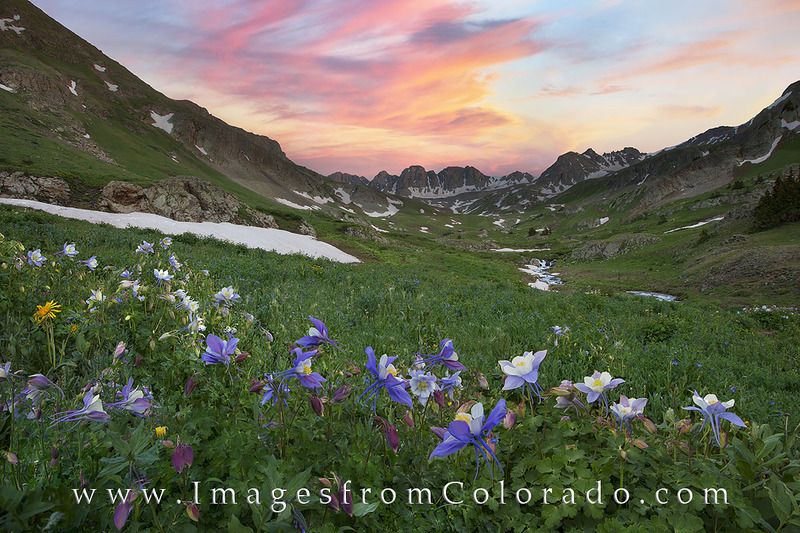 Columbine and other Colorado wildflowers enjoy the cool evening at American Basin, a short 16 mile drive down a bumpy dirt road near Lake City. I had camped at the nearby Silver Creek Trailhead with plans to hike Redcloud and Sunshine the next morning. However, I wanted to photograph these beautiful wildflowers, as well. I had almost given up on the clouds lighting up, but thankfully for a few brief moments, the sky turned pastel shades of pink, orange, and blue. Photo © copyright by Rob Greebon.